Start your day off on the right foot with these morning meal options. Q: What's the optimal breakfast to eat for muscle gains? While you’ve likely heard breakfast is the most important meal of the day, let’s be realistic for a second. No meal is more special than the next; what you do during the course of the day or week is what matters most. Now, for those who love their breakfast, some recent research suggests you may want to rethink the amount of carbohydrates you include in that first meal. Your breakfast should be based on your current performance or physique goals. You should also try to find something that you enjoy and won’t have a problem being consistent with. I recommend a high-protein breakfast with a moderate amount of dietary fat from medium-chain triglycerides, or MCTs. Here’s why: A recent study compared the results from three different breakfasts to determine how “anabolic” they are. The participants of the study had either protein only or protein plus carbohydrates, or fasted during breakfast. The protein-only and fasting groups displayed significant increases in growth hormone, whereas the protein-plus-carbohydrate individuals showed no changes. Growth hormone is an essential part of your muscle-building goals, as it helps to spare amino acids in the body. Also, cortisol— your stress hormone—was lowered the most in the protein-only breakfast. So why include the MCTs? Medium-chain triglycerides are easily absorbed fats that, unlike normal triglycerides, can be used immediately for energy. Studies on MCT usage have shown increases in growth hormone, more fat being used for energy, and an increase in metabolism. Having some fat at breakfast may also shift the body toward using more fat as fuel during the course of the day. 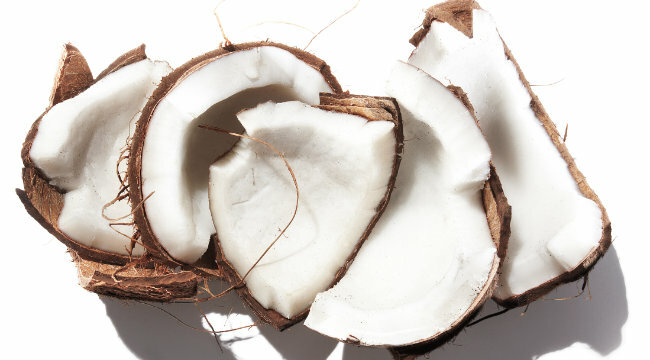 Coconut Oil: High in MCTs (66%), specifically lauric acid, which helps with cholesterol. Organic Eggs: High in protein (and its associated leucine) as well as healthy dietary fat, which is high in omega-3s. MCT Oil: Made of 100% MCTs and very easy to throw into a protein shake if you’re in a hurry. Grass-Fed Beef: When cooked in coconut oil, it tastes amazing and delivers the protein and nutrients you need to grow muscle. Any High-Quality, Low-Carb Protein Powder: Mix with water and a serving of MCT oil if time is an issue. The MCT s in coconut oil have been shown to increase HDL (good) cholesterol, which can improve your overall cholesterol ratio.